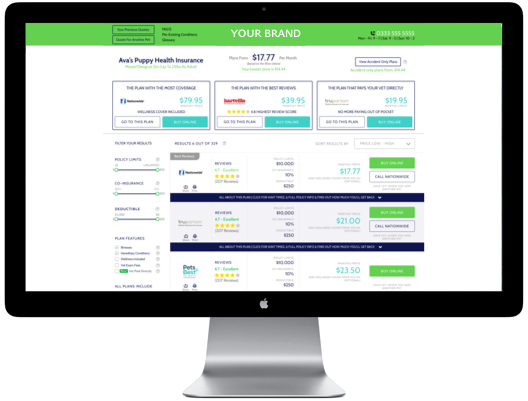 Welcome to the PetInsurer.com pet affiliate program, where we love to work with brands that want to promote pet insurance to their audiences. 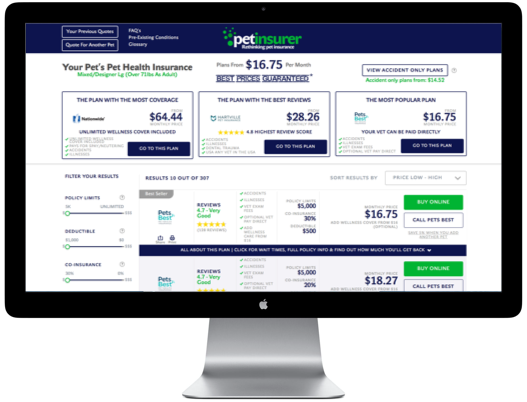 PetInsurer.com is the fastest growing name in the pet insurance market and there’s a great reason why – we’re the only specialist pet insurance comparison service in the USA. Think of us as the Expedia for pet insurance. We’re able to offer a brilliant affiliate program where you can earn a market leading income, and also, a fully customized white label pet insurance program that you can read more about below. We aren’t just a single insurer with a limited set of rates for certain risks. We work with the biggest names in the pet insurance market to allow your customers to compare pet insurance and find their best policy, whether it’s from Nationwide, Pets Best, Petplan, Trupanion or many more. Your customers will complete one quick form and see results from all the brands above, and many more. They then refine their options according to what’s important to them. 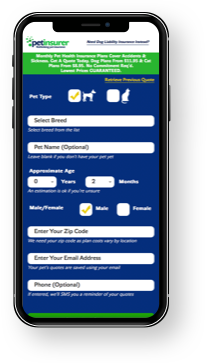 For example, they can choose to only show plans that include having vet exam fees that are covered, plans with wellness insurance included, plans where the vet is paid directly or even plans where they can save money by choosing an accident only policy. Regardless of circumstance, because we work with loads of insurers and have an average of 420 options per customer, PetInsurer.com will have a plan to suit any particular pet owner. Because we work with so many pet insurer companies, we can be ultra competitive on pricing in every circumstance. In fact, we’re so confident of this that we’re the only website in the world that guarantees your customers the lowest possible pet insurance prices. What’s in it for your brand? We want you to be a really successful partner and we pay more than any other company in the pet insurance space. You can easily earn over $100 per pet when using our pet insurance affiliate program. Want a fully branded solution in your company identity for your customers? PetInsurer.com is unique in that we can provide a fully customized white label pet insurance service for your audience. This service is reserved for brands that have bigger audiences of pet owners and we are very careful whom we work with for this. We can fully white label a customized solution for your brand in your identity, meaning that your customers stay within your brand look and feel when they get an insurance quote. This usually involves an increase in conversion, as your customers already trust your brand for other products, so as an extension of your offering, pet insurance is just another thing that you do. We can even help you build out a great landing page on your site to explain this great new service you’re offering and show why it’s a wonderful benefit for your customers. There’s no cost for you in becoming an affiliate, or for the white label solution. We’re fully licensed in all 50 states with no restricitons. Let’s Get Started - Complete The Below Form. Your message has been sent successfully. We'll be in touch with you shortly. A great opportunity to provide more for our customers, without any risk.